Hello everyone! Welcome to the first article designed to introduce stylized strategies, tips 'n’ tricks, and fun combo’s to play in a game of Squarriors! I will do my best to keep these articles limited to strategies you can use while sharing a single game with friends. Some strategies in the future may require cards that everyone wants to play at the same time and would require to have your own copy to play. 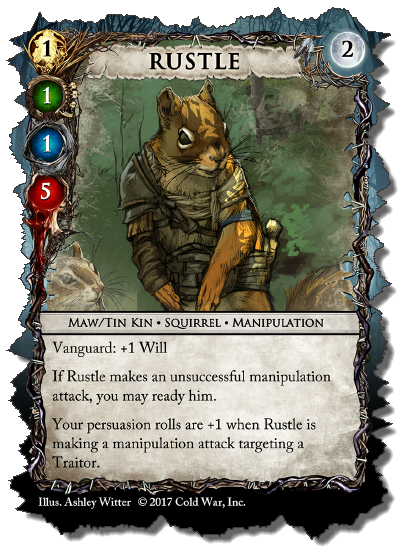 We will start with a look at Rustle who (I believe) is one of the most versatile characters in Squarriors the Card Game. At first glance he looks like a filler character to have in your tribe with a point cost of 2. His stats are in-line with most of the other squirrel type characters and he can sustain a total of 5 damage. Rustle’s game text has a few abilities that will help towards Manipulation attempts. If Rustle is part of your Vanguard, he gains an extra point of Will, which provides a small advantage towards success. If Rustle is unsuccessful in his Manipulation attempt, he gets a chance to try and manipulate another target by readying himself, until he is successful (or has no more valid targets). As an additional bonus, when you attempt to manipulate a Traitor target with Rustle, your persuasion roll receives a +1 modifier! If your strategy is Manipulation in a game of Squarriors, there is no doubt, Rustle will make the cut. However! Rustle can manipulate games completely, for devastating advantages. If you have spoken with us at conventions or seen some of our streams and videos, you have heard us speak about depth in strategy planning. Consider the following Domain card, Code of Might: Stealth. The text on Code of Might: Stealth reads, “Expend a creature here: Ready target creature you control in your Vanguard.” It would be a safe bet to think I intend on placing creatures in my Council and using them to allow Rustle to manipulate several targets a turn by placing him in my Vanguard. Have you figured out where I’m going with this? is a fan favorite tactic card that allows you to improve its target through many options. Another fantastic option is Instill Doubt. This Mark reduces the Will of the creature it is on by 1. This card also has a great ability to attach the Mark to another target for 1 Power! In the first couple of turns, with some saved power, you could attach this mark to each of your manipulation targets. To round out our Manipulation strategy, we can include several other cards like Damning Conspiracy, Treachery, Diversion, and Full Infiltration just to name a few. Be careful though! As soon as your opponent sees you trying to steal their creatures, Rustle will be public enemy #1!